Following the excellent winter results on the venue, which saw a good number of forty pound fish banked, including two to myself, the big freeze that lasted over three weeks put an abrupt end to the feeding spree, and a downer on the fishing and any high hopes I'd have of a productive start to the main season. One or two of the anglers who had been here in January were keen to get back. This was the case in point of two you Dutch lads Gert- Jan Wijnhorsdt & Sjoerd Wildschut, who fresh from success in January were back in early March once the lakes were unfrozen. Fishing the sampe tactics that had been successful to others and to myself they used PVA bags and pellets on the plateau of the Tortue Lake, and in the deeper water of peg 13 to back 8 carp to 17kg in four nights. The second week of March saw my good friend Andy Lears and three of his friends, Tim, Mark and Chris on the venue. Andy returned to peg 11 where he had done well last May, Tim fished the next peg down while Chris chose peg 14 and Mark opted for peg 3 on the Croix Lake. This week sort of set the scene for the days and weeks to come, with fish being very localised. Andy struggled on 11 and eventually moved onto peg 5 where he was able to bank a few 20lb plus carp and a catfish. For Tim again the fishing was slow in the deeper side of the lake, but he did managed a PB mirror of 32lb 2oz. Mark caught fairly consistently with fish to 31lb. Best result of the week though was to Chris on 14. He managed around 10 fish with the best being a new PB 42lb Mirror. The later part of March saw poor weather with very cold conditions some early morning ground frost and despite a fair amount of sun the eventual degradation to rather wet conditions was able to get the fish feeding hard. The catfish were now on the move with a few getting landed on boilies and pellets. 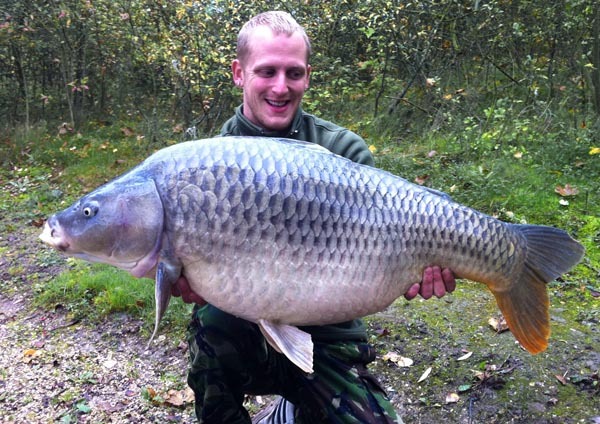 François Van Hooft managed a few nice fish both carp and cats, topped off by a cracking 47lb common. Paul Jones opposite in 13, managed 7 fish including 4 thirties to32lb. April Shane Hames and a group of five fished the Croix Lake. The weather continued to be unpredictable and remained very cold for the time of the year, with the rain becoming more present daily. The groups mostly fished PVA bags and 18mm boilies. They totalled 18 carp between 20lb & 30lb and one 30lb catfish. April continued with no real improvement in temperatures, but a considerable increase in rainfall. The tracks around the lakes became muddy and the water levels, although low for the time of the year started to rise. Dutch anglers Jan de Jager and G. Bruisma on peg 11 managed a 50/50 mix of carp and cats on boiles, with the best carp going 38lb and cats to over 50lb. Their catches were more consistent than others on the venue. Stu Rielly and his mates, Ian & Dan struggled early on, but still managed a new PB cat of 60lb to Stu, carp to 25lb for Dan, but Ian coming good in the end with carp of 28lb, 32lb, 42, and topped off with the twotone common at 48lb 13oz. During the same period on the Croix lake, venue regulars Harry Van Leuwen and his mate Dennis de Vries managed a couple of carp per day finishing the week with a dozen fish to just under 30lb. The last day or so of April saw the weather warm somewhat but the heavy rain has not abated and the consistent temperatures and conditions that are really needed for the results to be consistent have yet to materialise. The Spring weather has been all over the place and so have the catches. Curiously enough things were better in January. At about 5am, a couple of bleeps and a steady run, on my left hand rod, signaled that I’d had a take. The fish did nothing special before rolling into the net. At 25lb it was a nice start. I did a couple of pictures and slipped her back. I hooked on a new PVA bag and cast it back out. I had just got back into bed when the right hand rod tore off. After a spirited fight a very chunky mirror was landed. At just 21lb I didn’t bother with a photo and put her straight back. The day was quiet, spent making up a few more PVA bags and reading my book. The HiViz baits dind’t seem to be making a difference. Not long after finishing my dinner, I had a fast run on the left hand rod. As soon as I made contact the fish took more line. A sign that is was a better fish. And after a plodding fight, typical of a big kipper in these deep margins, I managed to bank a lump of a common. I struggled up the bank to the unhooking mat. As I hoisted her onto the scales the needle went round to 41lb 8oz. I was over the moon my second forty pound plus common this month. This time the skies were clear, so I was able to take a couple of shots of the fish before I let her go. The rod was cast back out and I was back in the sack, as the night was getting cold early. The skies had cleared after an overcast day with occasional drizzle. I could tell we were in for a frost. Again I’d not long been back in bed when the right hand rod was away again and a 24lb mirror graced the banks. I then managed to get a few hours sleep, warmly tucked up in my sleeping bag. Around 5am a very large bream woke me up. Despite it being a real specimen, I could feel the cold coming down, so I unhooked it in the edge and got back to bed. As the sun came up I could see that the morning was indeed clear and crisp, with white frost over the swim and surrounding margins. As I put the kettle on I had to tip the ice out of my cup, and could hear the frozen water rattle around inside my water bottle. Winter seemed to be with us. Its funny, running the fishery commercially means I don’t really get much chance to fish in the warmer months, and the last three winters have been very cold, with snow and ice for prolonged periods. This year has been a very different scenario, as I’ve already pointed out in other posts. 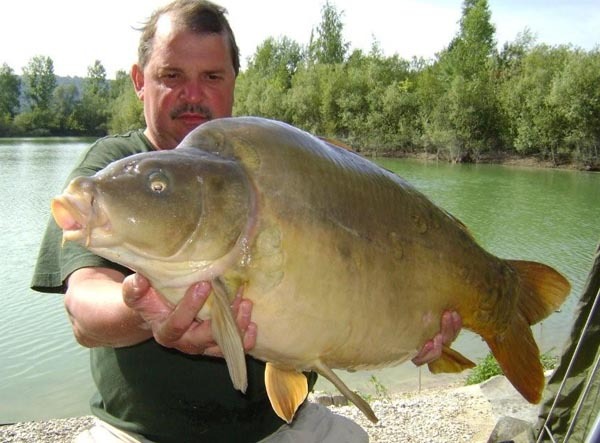 It just goes to show that if you get out there the carp remain catchable. My tally for the month ws now at 9 carp to 46lb a large Crucian and a bream. One thing that has puzzled me though is why, bearing in mind the large number og 30lb plus carp there are int he lake, my catches were only modest sized fish or big ones. The same was true for the few clients who have fished here this winter. I guess its just the lottery that is carp fishing! Check out the most recent video uploaded by Gareth from The Croix Blanche Complex by clicking here and then clicking on the Videos Tab. Enjoy! Well it’s been a while since I’ve had time to update the blog with any catch returns, as we’ve just been so busy this year. Not only have we been very well booked out in both the fishing and the accommodation, but we have moved our horses to the pasture behind the lakes which needed fencing in and a shelter building. Well back to the lakes… What stands out as I review this update is that the best catches have come to lake regulars. I guess it is the same on your domestic waters, but you get better results once you get to know the water a bit better. It's not a given as many of the first timers also have excellent results. Well the catfish well and truly woke up and any amount of pellet of boilie had them camped in front of your peg. 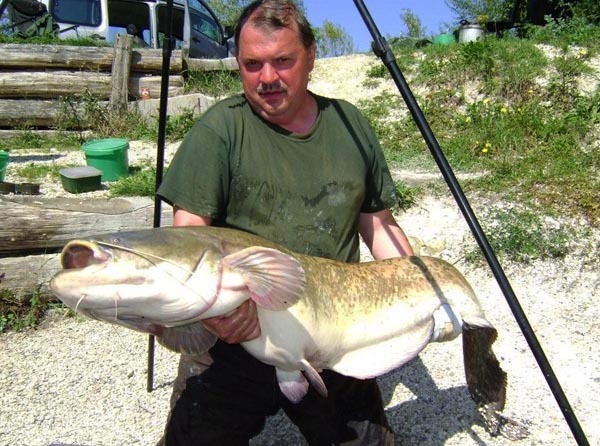 Belgian anglers Katia Hoorne and Jonas Goosens managed a good haul of cats as well as a few nice carp. Katia got off the mark with the two-tone common at a weight of 48lb 2oz. 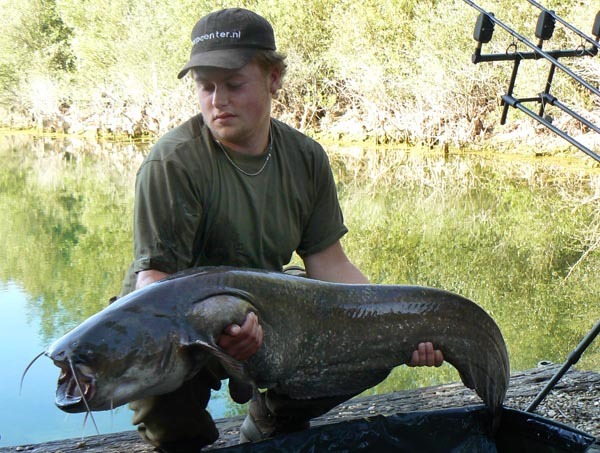 Jonas certainly managed to tame the cats with fish of 94lb 6oz & 70lb 4oz. Uk angler Graham house further up the Tortue lake was directly targeting the larger cats and managed to bank another 90lb plus fish at 91lb. Highlight of the month was a superb 57lb mirror to John Evans on peg 2 of the Croix Blanche Lake. I’ve been looking through old photos to tray and see what weight this fish last came out at but have not been able to identify it…Nice one John!! May carried on from April as one of the hottest months so far with temperatures beating all records. 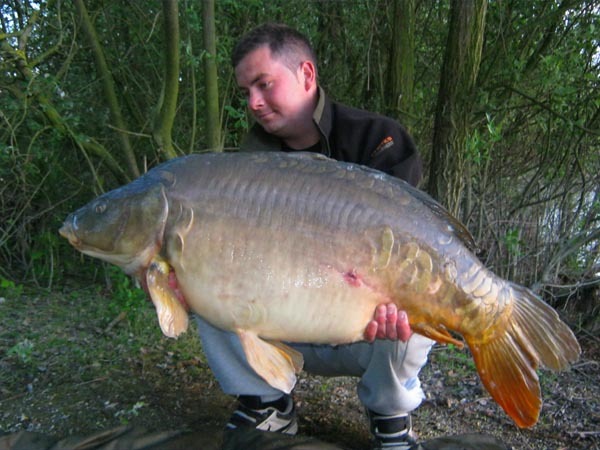 The second week of May saw venue regular Andy Lear and his mate Tim fish the Tortue lake. Andy slowly built his swim up and finished with some excellent fish including the big common, which was at its lowest weight for a good while at just under 45lb. He landed over a dozen fish with mirrors to 35lb plus and a 43lb catfish. 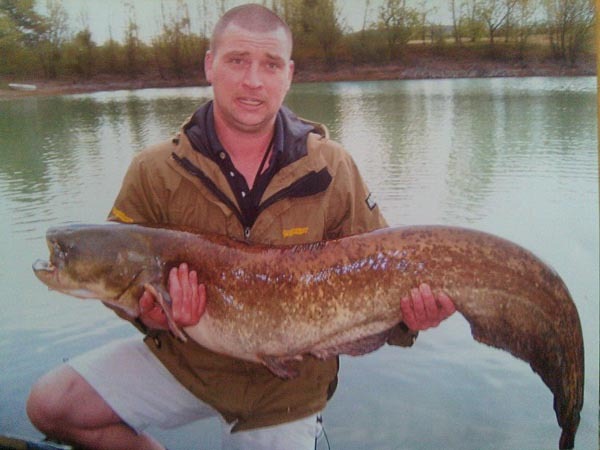 Rus Jaggers and Darren Dodde both got amongst the carp at the end of May. The duo both managed braces of 36lb mirrors with other back up carp and the odd catfish. Another venue regular Steven Breitsprecher and his mate Lee Cotterell both fished the Tortue and had a superb haul of carp to over 45lb. Between the pair they banked over 48 fish including two 70lb plus catfish. 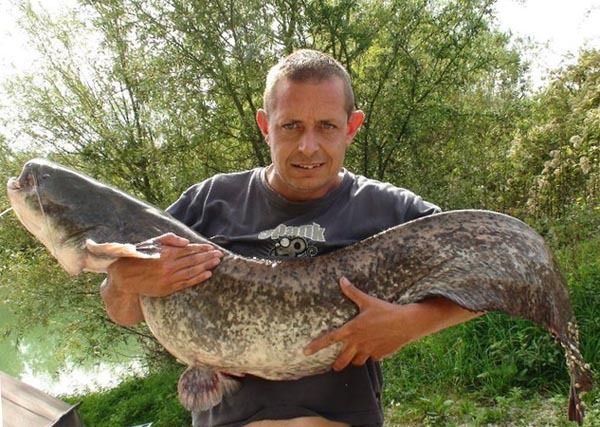 Not to be outdone Dutch angler Arno Lubbers on his second trip this year already to the venue had an equally impressive haul of carp and catfish. His best carp was a 50lb 5oz Mirror, with a total of 22 other mirrors and commons including a further fish over 40lb and 2 catfish to 30lb plus. (I’m currently waiting for photos from these two groups as their total for the week was over 70 fish to just three anglers. A real red letter week. 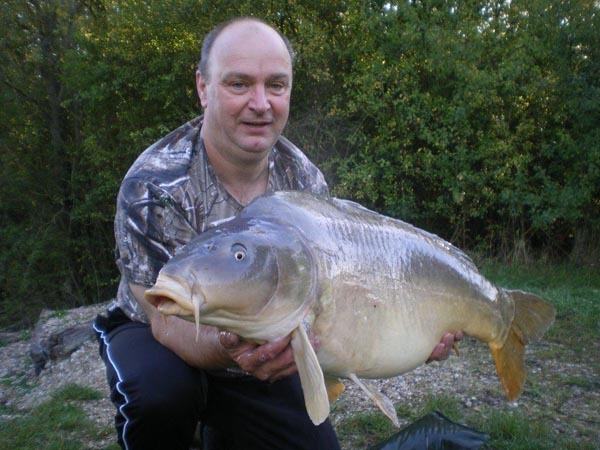 Belgian angler Rudy Coussens was on peg 6 the following week and he had a really good week, with over 50 runs. His tally included carp to 38lb 8oz and catfish to 33lb. 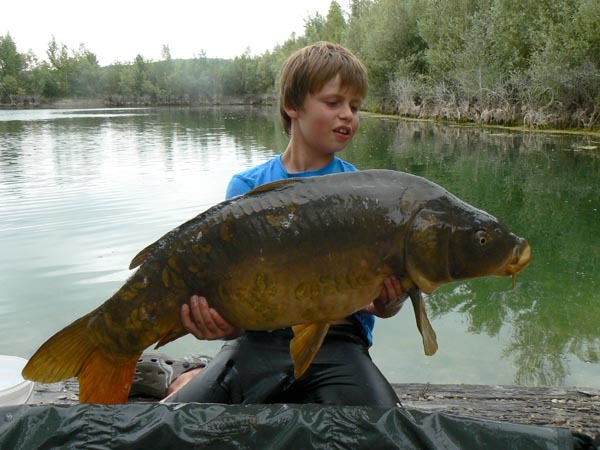 The following week saw young Dutch angler Bob Van Leeuwen visit the venue on a two week work experience. Initially he set up on the stock pond, from which I had already moved around a dozen of the stock fish to the Tortue Lake. He was soon rattling up the captures of both carp and grass carp and we soon had the tally of over 30 twenty pound plus mirrors relocated to the Tortue Lake. The odd one quickly started to put in an appearance on the banks. That middle week was Dutch anglers Eric Willmse and Erik Berne fish the venue. Both had nice catches of carp with Willmse landing the twotone common for its third sortie of the season at just 45lb, as well as 15 other carp between 24lb and 33lb. Erik Berne and his mate on the opposite side of the lake landed both carp and catfish with mirrors and commons over 30lb and catfish over 50lb. Young Bob on peg 13 managed to land a few too with carp to 33lb. During June the weather broke somewhat with several very violent thunder storms and a number of days of rain. July has kicked off in a similar vein, but more of that in the next update. One of the main Winter tasks on the fishery is stock management, or to be more precise, the ordering of new fish. In France this means you have between November and March to get an order in with a reputable fish farmer and get your delivery of new fish. Now I’ve never been convinced that winter is the best time to stock, as it’s the time when the fish are at their most lethargic , are not feeding strongly are more susceptible to virus and if they do get a knock in the transport they will heal very slowly. I do know though that the lethargic state of the fish is the main reason fish farmers chose this period to transport stock, as they do in fact damage themselves a lot less in very cold water. So I guess you have to roll with the way things are done here in France. I add the stock to the stock pond, you’ll remember if you’ve read earlier posts on this blog that I received over forty 20lb plus fish in November 2010. These fish were introduced to the stock pond, fed over the winter and moved to the Croix Blanche lake in June & July 2010. I had the help of my Dutch friend Peter and by simply setting up to fish we managed in fact to catch 50 fish from the stock pond, most of which were over 20lb, upto 25lb. This extra boost to the Croix lake made a big difference to catches, and helped stir up the existing stocks too. Some large bags of carp were had throughout August and September and two of the existing fish came out over 40lb, the best being a 46lb 5oz Mirror. Following the ongoing stocking programme for the complex I reiterated this procedure by ordering 35 fish from Simon Horton, three year old carp weighing from 18lb to 27lb. Again these fish were introduced to the stock pond to over winter and will be captured in the same way by hook and line to be moved to the Tortue lake next summer. The benefit of transferring the fish in summer is that they have a far higher tolerance to any viruses in their new environment and will have time to build up immunity during the hotter months. Having discussed the matter at length with a French fisheries vet, he assured me that the warmer the water the better the chance of the carp surviving unharmed in the new lake. This was born out by the fact that all the fish transferred from the stock pond in July have survived the move. These fish should pile on the weight in the new water. 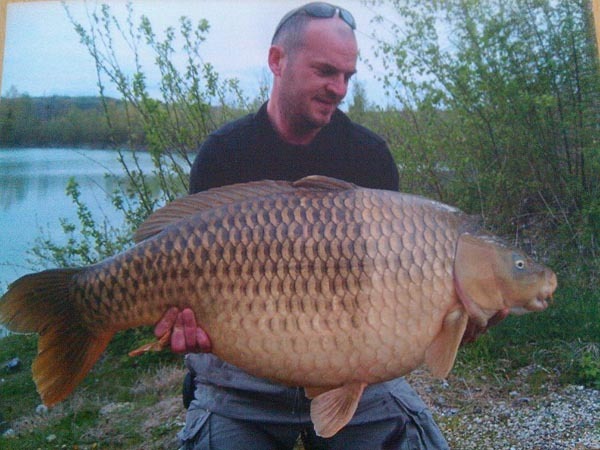 As the weather in France continues to remain mild the carp on the Croix Blanche lakes have remained active and have fallen regularly to anglers baits. Belgian carpers Paul and Pascal Rooseparck, on their third visit to the Croix Blanche venue, once again got in amongst the bigger venue residents. . The run of excellent catches started in early November with Eric Dalenoord and a trio of forties and has continued well into the month with the latest haul of big carp. 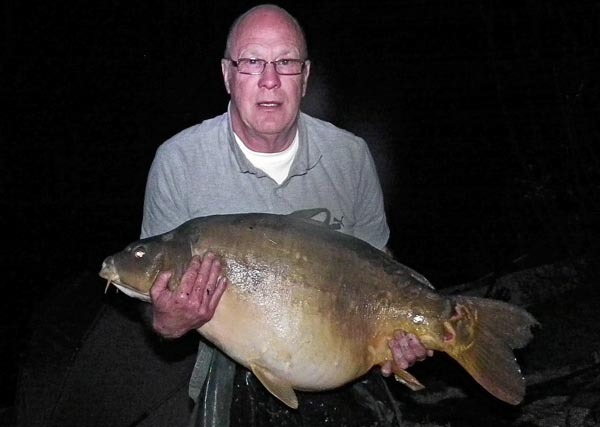 Indeed Paul Rooseparck in just two night’s fishing managed six big carp the two largest topping the 40lb mark. Fishing on the productive peg 13 on the Tortue lake Paul banked mirrors of : 46lb 2oz; 41lb 8oz; 30lb 8oz; 29lb 7oz and a common of 30lb 8oz. The successful tactic was bait boating boilies and particles to the central plateau and deeper water in front of this swim. This latest hit of fish comes on top of the week in July when Paul landed over 20 fish to just under 40lb.